Monster Jam Military Appreciation Night – Friday, February 14th, 7:00 p.m.
Feld Motor Sports and Monster Jam are proud to dedicate their opening night performance in Cleveland to those who have served, or are still serving in the United States Armed Forces. Throughout Military Appreciation Night, Monster Jam will salute the men and women of the military for their dedication and the sacrifices they have made to serve our country. Additionally, active duty and veteran military members can receive one FREE ticket to Opening Night. Tickets can be picked up at the Quicken Loans Arena box office with a valid military ID, between Monday, January 27th through Friday, January 31st. All tickets $3 more day of show, so buy your tickets early! A sold-out event year after year, Monster Jam’s Party in the Pits runs from 10:30 a.m. to 12:00 p.m. on Saturday, February 15th and Sunday February 16th, prior to the 2:00 p.m. show. The pre-show pit party gives fans (with a pit pass and show ticket) the chance to see these larger-than-life monster trucks up close, meet the drivers behind the wheel, take pictures and get autographs! Pit passes will be available for $10 online at theQarena.com after tickets have been purchased and at the Quicken Loans Arena box office, while supplies last. You can get 25% off your tickets when you enter Promo Code MOM25 at check-out. Offer not valid on Opening Night. Not valid on Gold Circle or VIP seating. No double Discounts. You can buy your tickets here. 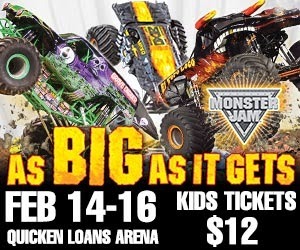 Like Monster Jam and Quicken Loans Arena on Facebook and be sure to share with friends! Follow Monster Jam on Twitter. Thanks to Feld Family Entertainment I am able to offer a giveaway for a family 4-pack of tickets to one A Busy Mom of Two reader. Today is National Pie Day. I think it is fun that everything seems to have it's own holiday and who doesn't love a good pie? My favorite pie is Lemon Meringue or a good mixed berry. What is yours? I wanted to share a pie recipe with you, but I didn't have any ready, so here is a recipe for mini cannoli cups, which use pie crust for the shells. It is really hard to believe that we are more than half way through January already. Weren't we just on winter break? Life is starting to get busy again as we enter the new year. The kids are in swim lessons, my son plays soccer and is having baseball practice, and my son has been going to youth group with a couple of friends. All but soccer occur during the evening and so we have to be a little creative in timing for meals to allow everyone to get to their activities. Trying new recipes last week was so much fun and a real taste treat that I decided to do it again this week. There are a few familiar favorites mixed in, but also some new to us recipes. I will post my favorite recipes, the real keepers over on my cooking blog: A Busy Mom of Two in the Kitchen - I just can't promise how quickly they will go up. It's shaping up to be a cold week here. Glad I put chili and soup on the menu plan this week! The first couple of weeks of the new year have not been very typical. I started the year with a cold, that turned into an infection and left me with a pain in my side. Needless to say, it hasn't helped me in support of any of my goals for the year. One nice thing is that my goals for this year are primarily a continuation of the activities started last year. I want to continue to prepare nutritious and flavorful meals for the family, maintain a regular workout routine, and hopefully, as a result be healthier and with any luck, lose some weight along the way. 2. Put ‘family dinner’ on the schedule at least three times a week and commit to those days as a way to connect with your spouse and children. 4. Get the whole family involved – whether it’s cooking or cleaning, making it a team effort will ease stress and make it fun! 5. Try to meal plan at least one week each month – it means fewer trips to the grocery store (and less impulse spending) and no uncertainty about what’s for dinner. As I check out these challenges, I am happy to report that they are all part of my routine. This week, my menu plan included five new recipes actually. That is a little heavy on new, but sometimes you just need something new. (so far they have all been keepers). So, I guess I am over-achieving on #1. We eat dinner as a family close to 7 nights a week. It has alwasy been a priority and a goal of mine. As we get busier with sports, it gets more challenging and sometimes it is only 3 out of 4 of us sitting down together...but we still sit down. Having dinner together most days can be a challenge, but with creative menu planning and some prep work, it can be done. Sure, it means that sometimes we at 5 pm and sometimes we eat at 7 pm, but we are flexible that way. I suppose that three food groups might be the one that I sometimes miss. I'm usually good at dinnertime and for packed/purchased lunches. but it is more of a challenge at breakfast or a weekend lunch. Generally, I handle meal preparation. Even on the nights that my husband starts dinner, I generally do the prep work and he just has to start it. The kids are in charge of helping to get things set up for dinner. Then after dinner, they take their plates to the sink and clean up the crumbs on the floor at their seat. Meal planning is part of my routine for several reasons, which I discussed here. Did you make New Year’s resolutions this year? If so, did any of them involve your cooking goals? What is your number one cooking goal for this year? No compensation was received for this post. All opinions expressed are my own or that of my family. As a Hormel Foods Extended Family Blogger, I received suggestions and information from Hormel for this post. No compensation was received for this post. Complimentary product was provided for this review. All opinions expressed are my own or that of my family. As I mentioned in my review of the MyQ Universal Smartphone Garage Door Controller review, we weren't able to make it work with the builder installed opener that we had. We had the opportunity to receive a Chamberlain HD930EV Ultra Quiet Belt Drive Garage Door Opener, which we had installed over the holidays. We elected to have someone install the opener rather than do it ourselves, but the installation seemed straight-forward and did not take long. So far, this new opener is such an improvement over our old opener in so many ways. First, the Chamberlain HD930EV is a ultra quiet opener. It used to be that I could tell when my husband was coming home because I could here the opener operating from many corners of the house. I always worried about disturbing the sleeping family when I would head out early to work out or head to work. Second, the light on the opener unit comes on when motion is detected. The light on our old opener was one that you had to turn on from the control panel and sometimes, it would come on and flash. The control panel for this opener does have a light button, which you can use to turn the light on or off, but since it comes on when we enter the garage, we haven't had a need to use it (other than to shut it off when the light is not needed). In addition, this opener has two lights, one on either side of the garage. It provides a brighter light than our old opener. Third, the control panel is back lit and features a time and temperature display. We have a clock in the garage, but I like that there is a clock on the control panel. Fourth, the range on the opener is better than my old one. I can push the button on the remote from the corner and the garage door will begin to open. With the old one, I almost had to be in the driveway to open it. Fifth, the opener comes with a battery back-up. We live in an area with underground power wires, so we generally don't have too much issue with power outages (at least relative to other places that I have lived), but it is good to know that if we did have an outage that we could still get in and out using our opener. Sixth, the opener came with the wireless keypad for outside of the garage. With our last one, we had to buy it as an add on, so having it included was nice. There are some draw backs to the opener though too. The biggest being that it is not compatible with the HomeLink that we each have in our car. The cars we drive aren't that old (2006 and 2011 Toyota), so I would have expected that it should work. You can purchase a repeater to allow you to operate the opener using HomeLink, but I don't see the benefit in that. So, for now, we are back to using the remotes that come with the opener or using the MyQ app on our iPhones. It works, but old habits die hard and I continue to reach for the HomeLink button, only to remember that it doesn't work. The opener is much slower than our old one. Not a big deal, but when I am running late, a little frustrating. Plus, in the morning (especially when it is cold or dark), I tend to get in my car before opening, so I have to wait a little longer to start the car. The opener comes with the MyQ Internet Gateway, but to use the MyQ Internet Gateway you have to plug the unit into your router and into the wall. As such, we stuck with the wireless gateway that we had already installed, since it was also compatible. It would have been nice if the opener used the same wireless technology as the MyQ Universal Smartphone Garage Door controller. Again, it works, so it's not a big deal just a preference. Overall, I am pleased with the opener and find it to be an improvement over the opener we used to have. No compensation was received for this post. Chamberlain provided the HD930EV opener, so that we could share our experience with the product. All opinions expressed are my own or that of my family. It seems that every time we leave home, we get a block down the road and my husband asks if we remembered to put down the garage door. Most of the time, we are close enough that we take a trip around the block in order to drive by the house to make sure it is down and other times, we text or call our neighbor to ask them to check. 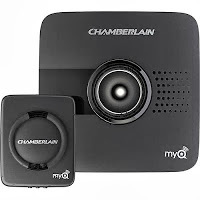 So, when I learned about the MyQ Smartphone Garage Door Controllers from Chamberlain, I knew it was a product that would be perfect for our house. The MyQ Smartphone Garage Door Controller works with a number of garage door openers and allows you to both check the status of your garage door from anywhere on your Smartphone and to operate it remotely too. So, with the MyQ we can now log in to the app on our phone and see whether the door is up or down. It also tells you how long it has been open or closed, a great feature that lets you confirm that your child has arrived home. Having a repairman coming to the house? You can easily use the app to open the door for them when they arrive - no need to give them a garage door code or a key to your house. The set up of the MyQ is fairly straight-forward. There is a bracket that mounts to your ceiling, next to your garage door operator that is used to attach the WiFi hub. A door sensor is installed next to your garage door. The third step is to connect the WiFi Hub to the home network - with an iPhone or iPod, you use the BlueTooth feature and then launch the app to complete the set up and with other devices you use the web browser to set up the MyQ. There are several models of garage door openers that the MyQ works with and you can find a list of them here. Turns out (after a good amount of effort and reading the help on the website) that although our manufacturer was listed, we had an opener that the MyQ couldn't learn to operate. We could still use the monitoring aspect of the device/app and were able to see if the door was open or closed and how long it had been there, but if we were away and the garage door was open, we wouldn't have been able to close it. In order to allow us to experience the MyQ Smartphone Garage Door Controller, the group at Chamberlain offered us a new garage door opener - all we had to do was install it. Once the new garage door opener was installed (more about that here - Chamberlain HD930EV Garage Door Opener), we were able to start testing out the MyQ Garage. We learned a few things early (that we wish we had learned earlier) and put it through the paces. You can install the app on multiple devices and can put a security code on the app, so that others can't operate your garage door. I like this added level of security. What we didn't know right away is that there can only be one account per device. My husband had initially set it up with his e-mail, but once we found out that we could only have one account, we decided to change it to our joint e-mail account. Unfortunately, we were not able to find a way to do this on the website and had to delete his account. This meant having to reset up the device with the new log in - not a big deal, but it did take some time. A nice benefit of this feature is that in order to add the app to their device and use it, someone would need to know your username and password. We tested the app near and far. When my husband was away from home and on another WiFi network, he sent me a message and then tested that he could operate the door from there. When I was further from home at work, and on a WiFi network, I tested that I could operate the door from there. We also tested it on 3G, near and far. We had some challenges with the 3G operation being consistent. If the 3G signal was not strong, I wasn't always able to connect to the opener to operate it but once my signal strength returned it worked. We also had an issue when I tried to open it and immediately close it. Normal operation wouldn't typically find you opening and closing within a few seconds and I didn't have the same problem when I allowed time between operation, so I wasn't too worried. I don't really know what didn't work, but my guess is that once operated, the system needed a minute to return to 'steady' state. A good thing to note is that when you operate the opener to close it from the app, it sounds a beep and flashes a blue light before it begins to operate. I like this safety feature, in case someone would be in the garage when you close it they would have a warning. Overall, we are very pleased with the MyQ Smartphone Garage Door Controller. We like the added security of being able to check that our garage door is closed. It is nice to know that if we need to let someone in to the house, that we can operate the door from elsewhere rather than giving out our security code for the external keypad. I also like that if I am out with friends, I don't have to worry about taking keys or fumbling in the rain or cold with the external keypad...I can use my phone to open my door when I arrive home. If you are looking for a home automation product to allow you to monitor and operate your garage door, then I would recommend checking out the MyQ Smartphone Garage Door Controller. No compensation was received for this post. Chamberlain provided the MyQ Universal Smartphone Garage Door Controller, so that we could share our experience with the product. All opinions expressed are my own or that of my family. BRRRRRRRR! That is really all I can say at this point. We are supposed to have a rather cold two days and the temperature itself is only half of the issue, the wind chill is supposed to be even colder! Ideally, I should have planned some more cold weather type meals, but the grocery stores were so crazy this weekend, with the pending forecast that I picked up a few things that I knew I needed and decided to eat from our stock otherwise. The kids got an extended holiday break when the schools decided to just stay closed the next two days, so lunches will be at home - probably grilled cheese, peanut butter and jelly, scrambled eggs and other such concoctions. Then, we return to a more normal week of lunches from the school or the occasional packed lunch for the kids. My husband and I continue to rely on leftovers, frozen meals and sandwiches for lunch. Have a happy and safe new year! May 2014 be full of blessings for you and your family. May 2014 be a great year for everyone.